View More In Promise Rings. 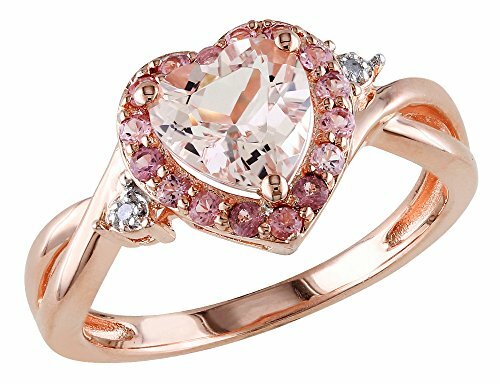 This striking gemstone ring features a heart-shaped Morganite surrounded by a halo of sparkling pink tourmalines and two shining diamonds. The band is crafted in sterling silver with rose plating and has a delightful twisting design. Elite customer service offered by Gem & Harmony - Shop with confidence! FREE Expedited Shipping UPGRADE on all orders over $300! Simply select STANDARD shipping at checkout and we will ship EXPEDITED. If you have any questions about this product by Gem And Harmony, contact us by completing and submitting the form below. If you are looking for a specif part number, please include it with your message.